Humpback Rocks Visitor Center and Farm Museum is a great stop for people driving the Blue Ridge Parkway in Virginia. It's not far off of Interstate 64 at milepost 5.8 of the Parkway. The homestead farm is a great place to spend some peaceful time amongst the 19th farm buildings. You get a feel for life as it was long ago. Early European settlers made a living from the native materials that flourished in these Appalachian Mountains. Chestnut, hickory, and oak trees provided nuts for food and logs for building, while rocks uncovered where farming was to be, were used as foundations and chimneys for the houses. There are also some stone fences to keep livestock from wandering away. There were many farms in this mountainous area. It seems strange to me that folks would choose such a cold place compared to maybe setting up home in the valley. 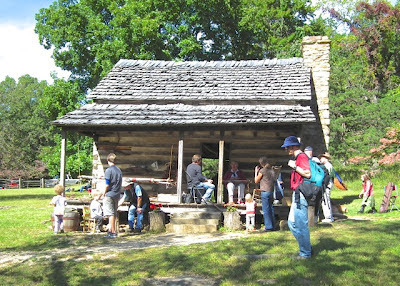 The National Park Service assembled actual buildings from nearby locations to create the homestead. The visitor center has exhibits explaining more about this kind of life and there is a picnic area also. Actual farming takes place and interpretive people in period costume demonstrate local crafts and skills. 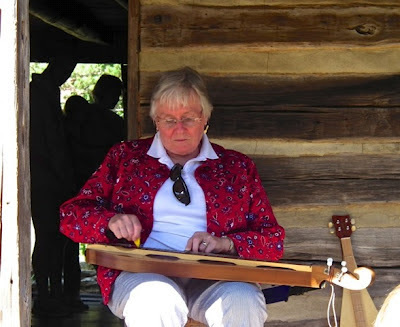 During the summer there are "music in the mountains" events, which is what we attended just a couple of weeks ago. The photo album is compiled of more than that visit, but you'll see the videos of the music group in the album also. A trail from the homestead leads up to another parking lot for a difficult trail to the top of Humpback Mountain. The mountain is named for an outcrop of rocks near the peak of 3,080 feet. Those who reach the summit can see in all directions. The 1 mile trail to the Rocks is very tough, gaining about 800'. The views are great looking west onto the Shenandoah Valley and north to Shenandoah National Park. View the Photo Album of Humpback Rocks Visitor Center and Homestead.